As a recruiter for Doctors Without Borders Canada/Médecins Sans Frontières (MSF), I am often asked by first-time medical fieldworkers what professional challenges they will face during their assignments overseas, and what impact their experience with MSF will have on their career development. I truly believe that the most challenging aspects of doing humanitarian work also provide the most rewarding and enriching experiences to our fieldworkers, both on a professional and a personal level. 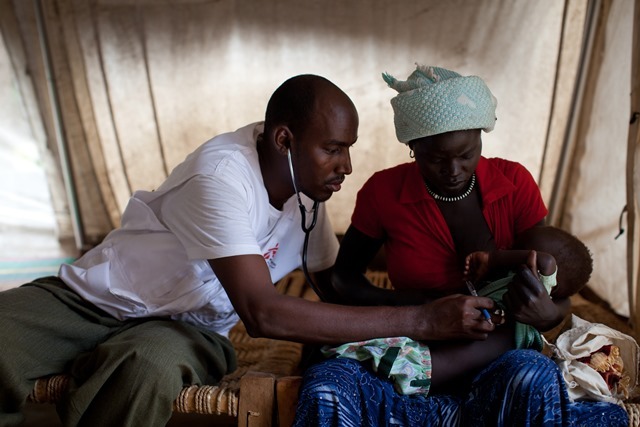 Jimale Mohamed, a MSF clinical officer, examines a young patient in the Out-patient Department of MSF’s hospital in Doro refugee camp. Doro is one of three Upper Nile camps sheltering at least 113,000 refugees who have crossed the border from Blue Nile state to escape a counter-insurgency campaign conducted by heavily armed Sudanese government troops. Refugees arrive at the camp with harrowing stories of being bombed out of their homes in the north, or having their villages burned by northern soldiers. The camps into which they have poured are on a vast floodplain, leaving many tents flooded and refugees vulnerable to disease. Mortality rates are at emergency levels, and diarrhea and malarial cases are rising. Doctors have already laid preparations for a cholera outbreak. Spending nine to 12 months providing vital lifesaving care to some of the world’s most vulnerable people is a humbling experience, since the needs often outstrip what is possible for healthcare professionals to provide. Many fieldworkers come back with a renewed sense of empathy, which is essential to being a great healthcare provider — something that is true whether someone is a nurse, doctor, pharmacist or any other kind of health worker. Our fieldworkers are often put into situations where they have to go outside of their comfort zones as professionals — whether they are being exposed to new diseases or pathologies, having to adapt to new cultures or living 24 hours a day with the same people they work with. International fieldworkers often have managerial responsibilities, and are called upon to supervise dynamic, multidisciplinary teams in very trying circumstances. Many of our recruits point to these experiences as contributing greatly to making them better and stronger leaders. Many people are not aware that MSF wants people to stay and grow within the organization, and to take on more responsibility. To help us do that, MSF offers training and career planning to our fieldworkers from their very first assignments onwards. We need people at all levels of our operations, from coordination positions — such as medical coordinators and country directors — to technical advisers in our various headquarters around the world. We have Canadians involved in every part of the organization, from medics on their first overseas assignments to the office of the MSF International President — a role currently filled by our very own Dr. Joanne Liu, from Montreal! I know that the readership for Hospital News is quite varied, so let me share with you what types of healthcare professionals we are currently looking for: We need physicians, nurses, pharmacists, midwives and administrators — and accountants too! For the complete list, check out our website at www.msf.ca and click on “Work with Us.” Professionals who also speak French or Arabic, have some global health experience or backgrounds working in rural and remote northern communities are especially sought after.